The Wikipedia article on the Robertson screwdriver gives an excellent example of how clumsy use of a patent hurts innovation. The Robertson screw (square hole, slightly tapered) is the best general-purpose screw drive ever designed, and accounts for about 85% of all screws sold in Canada — if you’ve ever worked with a Robertson screw, you immediately feel the urge to kick anyone who tries to make you use anything else, especially the Phillips screw with its easy-to-strip head. Henry Ford realized that Robertson screws would save him considerable time and expense on the assembly line, but unfortunately, after a bad experience in the U.K., P.L. Robertson was so fierce about protecting his intellectual property rights that he wouldn’t sell Ford a license to make them. Ford was too smart to bet his company on a single monopoly supplier — even if the product was vastly superior to its competitors — and to this day, more than 40 years after the last patent expired in 1964, Robertson screws are barely used at all outside of Canada. By being too inflexible about his IP, Robertson ended with up only one tiny market (Canada) and missed his chance to change to world. 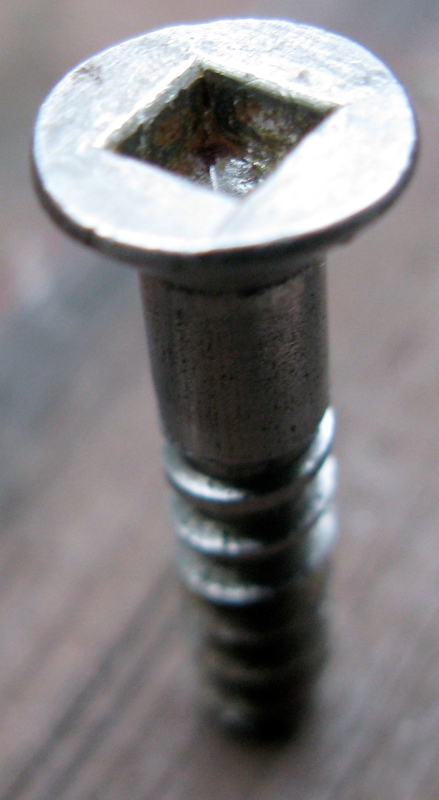 The WikiPedia article says Robertson screws account for 10% of of the screws sold in the U.S. As far as I can tell from the local home improvement store, that’s probably all from drywall and deck screws which are about 50% Robertson screws, which makes a lot of sense considering those tasks. That would explain why it’s so difficult to find screws with Robertson heads in SoCal! Or than Fuller scredrivers don’t exist here either. To use square-drive screws, just get a generic hexagonal-drive (eg any power driver) and buy a square-drive tip (or two; the wee ones are good for trim screws) at any large hardware store. Ive lived in 5 US states and never been more than a few miles away from a place I could get them, any Loews or Home Depot will do. Absolutely the best drive available, no doubt. BTW, Deck Mate screws can be driven with a square bit also. Best of both worlds, in fact, if you are willing to shell out the rather high price. I’m tired of 2″ and 3″ Phillips head deck screws stripping. Which home improvement centers, if any carry Robertson screws? yes i agree that the robertson is the best screw, and it is sad to me that its not a worldly used screw. i am a canadian, live in n.b and i use it when ever i can! According to the Wikipedia article, the Robertson is used 10% of the time in the US. I looked up the population of Canada and the US just now, and if we assume that the consumption of screws per capita is exactly the same in those two countries, then the number of Robertson screws consumed in the US is greater than in Canada. They are harder to find, but still used a lot. Patents are dangerous for future… How can we imagine living in a patented world ? Without patents, people would have no incentive to develop new things. It’s one thing to think of a great idea, but to take that idea to market, you need capital. Then you need to make that capital back. Without patents, the next biggest company around would take your idea, make loads of money off it, and you would be stuck with the debt. How can we imagine living in a patented world? You are so naive; we are living in a patented world. Everything is patented or copyrighted. From cars to music to breakfast cereal. Patents award the inventor and cover their costs (through either exclusive sales, or through royalties), then the patent expires and the technology is given to the world for free. Without patents, people would have no incentive to develop new things. What a bleak view of mankind. Not everyone is driven by money alone, fortunately. There are still those for whom curiosity is a force in and of itself, and they’re the ones who make the most lasting impact. Everything is patented or copyrighted. Thank goodness that copyright law can be used to subvert itself, so we can have free software and free culture.